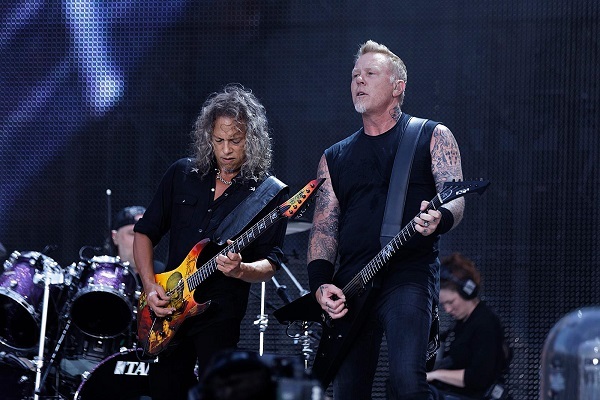 Metallica will reach the third anniversary of the release of their latest album, 2016’s “Hardwired…to Self-Destruct,” this fall, and the metal gents are well on their way to bringing together ideas for their follow-up to the record. Guitarist Kirk Hammett, in fact, has been coming up with too many ideas. Speaking with Australia’s Mixdown magazine, he’s fully loaded and ready to go. “We’re in our third year since Hardwired. Maybe we can get a bit more focus and go into the studio a bit sooner,” Hammett said in the new interview. The guitarist continued, stating that he has “a ton of material” already written for their next album. Metallica has been known to wait several years between albums. In fact, their last album, 2008’s “Death Magnetic,” came a full eight years before “Hardwired.” But, according to Hammett, that won’t happen this time around. “None of us are very comfortable with the fact it’s been so long, because that is a long time,” he said. Metallica has a slew of international tour dates up ahead on their WorldWired tour. The trek, which is in support of “Hardwired…to Self-Destruct,” will continue its run May 1 in Portugal and keep the guys on the road through November 2019.